Wikki Stix are resources for fine motor skills development that you can use to help your child even if you don’t know much about fine motor. They are also perfect when it comes to crossing the midline activities. These irresistible, mess free stix can be used over and over again in countless numbers of different ways making them perfect fine motor toys. While they can be used for building or working on a flat surface, they are ideal for working on the vertical surface which develops the foundational muscles for wrist position for handwriting. Fine motor activities for developing pencil control do not have to include a pencil! In fact, it is often better that they don’t! We are looking for the specific muscle development and manipulation that Super Wikki Sitx give us. In addition, by stabislising your child’s base by seating them on a small chair or firm cushion, they will cross the midline as they fill the working space in front of them. Wikki Six are a firm favourite for occupational therapy midline crossing activities. So, you can combine activities for crossing the midline with the development of fine motor skills all wrapped up in an irresistible package of fun. Wikki Stix are re-usable. They may leave a slight waxy film on your working surface which may be quickly wiped clean with a dry cloth. Looking for some fun cards to go with your wikkis? 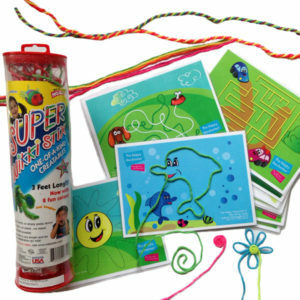 Take a look at our Wikki Stix and Activity Cards. One pack of Super Wikki Stix which includes 48 Wikkis which are each 91cm long .